Experience the 1st annual- A Christmas Nightmare at The Dent Schoolhouse! The entire schoolhouse is celebrating Christmas! Charlie the Janitor... now Santa Charlie, has decorated the entire attraction with garland, lights, presents and Christmas trees. Best of all, new holiday monsters have taken over the attraction to bring a grizzly twist on this beloved holiday. 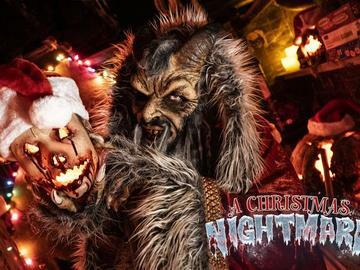 This is not your mall visit to Santa... this is a Christmas haunted attraction! This 2 night special event is December 7th and 8th. 6:00pm - 12am. TICKETS PURCHASED ONLINE MAY BE REDEEMED ONE TIME EACH. YOU CAN ONLY USE YOUR TICKET FOR THE SPECIFIC DATE YOU PURCHASED. PLEASE PRINT AND BRING YOUR E-TICKET WITH YOU OR HAVE READY TO SCAN OFF YOUR CELL PHONE.